Backpacking tourism has become thriving in Vietnam and trekking activities to conquer mountains have drawn much interest from young adventure lovers. Lao Than Mount in Y Ty commune, Lao Cai province, is one of the most checked-in summits by backpackers where they can bathe their eyes in seas of cloud. When it is seen from a distance, Lao Than catches the eye of visitors with a triangular monument, which is situated on its peak. Located in Phin Ho village, Y Ty district, Lao Cai province, at a height of 2,860 metres above sea level, Lao Than is considered as the roof of Y Ty border commune. It is known as Hau Pong Sam mountain among the local H’mong ethnic community. It is also named Nhiu Co San Bo (Nhiu Co San – The Father) in order to distinguish it from the mount Nhiu Co San Me (Nhiu Co San – The Mother), which stands on the opposite site of the former. It is around 7 kilometres from the mountain’s foot to the centre of Y Ty commune. It is not a tough challenge to conquer the mount, during which trekkers have to tackle the climb in a 16 kilometre-long hike (round trip). Therefore, a physically strong backpacker would be able to set their footprint on the peak within only three or four hours and finish the journey within one day. However, most of them prefer an itinerary of 2 days 1 night for their trek so that they spend a night at the peak so as to admire the captivating sunrise and bathe in a sea of clouds on the peak in the early morning the following day. The hardest part of the adventure lies in the final stage from the camping area where backpackers stop for their night’s sleep to the peak of Lao Than, as the climb is steep, strenuous and full of bushes. H’mong people are on their way to Lao Than peak to collect red cardamom, an indigenous plant which is used medicinally and also in cooking. H’mong people have a habitat to live in the high mountainous and remote regions and Y Ty is considered as a land of abundant sources of cardamom in Lao Cai. There are plenty of beautiful places during the climb where hikers can take great photos and check-in. 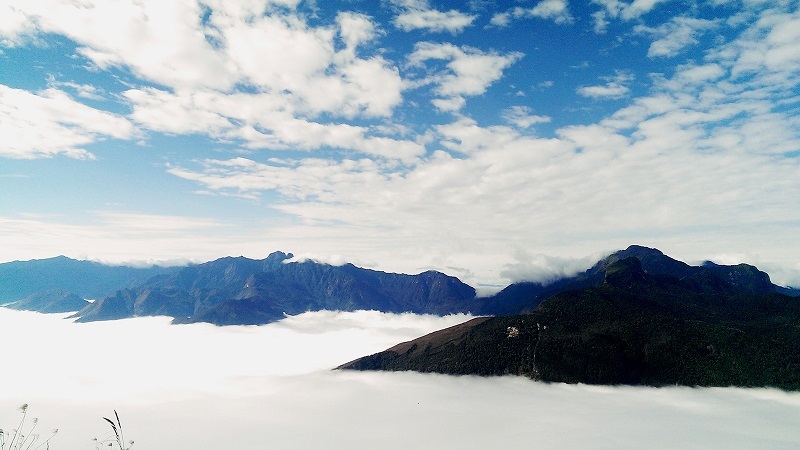 On clear-sky days, by standing on the top of Lao Than, one can enjoy stunning scenery with a view of Nhiu Co San Me, Bach Moc Luong Tu, and even the iconic Fansipan mounts on the opposite side. If backpackers visit the mount in autumn, they can admire the amazing Den Sang valley of terrace rice fields which are turning yellow during the harvest season. A kind of wild flower growing on the way to the summit, where the atmosphere is so pure for the growth of many unnamed beautiful trees and flowers. A golden moment of sunrise on the top of Lao Than mount. It is the most expected and highly rewarding moment of the adventure, as hikers have to wake up at 4 a.m., taking on a 45-minute climb in the darkness and windy cold to catch the scene. Chasing the cloud is the ultimate goal of backpackers at the adventure. Standing on a cliff and being surrounded by a bank of clouds, it is really a touch-of-heaven experience. A group of youngsters check in in front of the triangular monument on the peak of Lao Than. Concurrently, there are many tourist agencies providing tours to conquer the mount. Otherwise, backpackers can design their own plan with the support of local porters, who can be found in the centre of Y Ty commune under the mountain foot in Phin Ho commune. All they need to prepare is necessities for the trip, including water, shoes, gloves, flashlight and a portable charger.